Sydney Band 168 are Sydney’s finest exponents of authentic 50’s and 60’s Rock n’Roll. They feature the classic line-up of piano, double-bass, electric guitar and drums with the added bonus of four great lead singers who can create an impressive wall of harmonies. 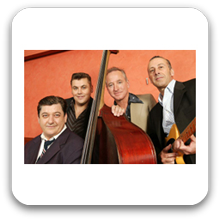 This tight line-up enables them to perform in all styles from Swing, Jazz through Rhythm and Blues to Rockabilly and 50’s/60’s Rock n’ Roll.